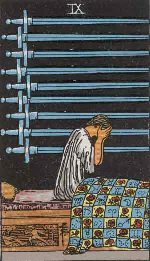 The Nine of Swords represents misfortune, desolation, failure and general ruin in your life – or said some authority in your past life. In a more positive way, this card can represent self sacrifice, personal suffering voluntarily taken up for the sake of the other person, or a greater cause. The Nine of Swords or the Lord of Cruelty card comes as a sad and unwelcome messenger. It, as its name suggests, indicates difficult times when you cannot expect any help or compassion from even those who have been your dear and reliable friends. There is something mechanical in the way the circumstances happen in your life. You cannot rationalize why the things are happening in a cruel way. When you introspect you cannot decide how far you are ethically responsible for your misfortunes. 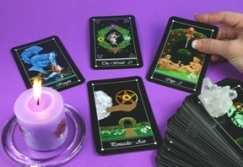 So this cards appears to indicate that someone is determined to cause you harm. You should, therefore, look around you to see who that person can possibly be. 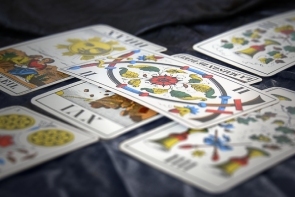 This card may also indicate that you yourself are out of sync with your inner needs and feelings. This card provides you an opportunity to seriously meditate over your difficult situation and try to improve it with a calm mind.